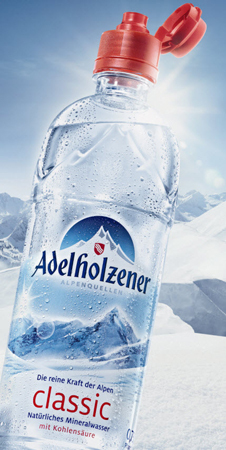 redesigned the bottle labels of the disposable and reusable Adelholzener mineral water as well as the bio juice spitzers. The new label design gives the consumer the impression that they are instantly entering the pure and untouched mountains of the Bavarian Alps. With the new disposable PET bottle designed by Landor, the Adelholzener mineral water, the only German mineral water from the Bavarian Alps, and bio juice spritzer can now enjoy an attractive and yet practical packaging. “The new look of the mineral water and bio juice spritzer points out their unique origin“, saysAlexandra Kontetzki, Senior Client Director of the brand consulting and design firm Landor Associates in Hamburg.